All About La La Anthony’s Winter Wonderland-Themed Charitable Bash – Check Out Her Sizzling Hot Outfit And Find Out Which Celebs Were In Attendance! For her New York-based Christmas charity event that took place on December 21, La La Anthony looked absolutely stunning. Check out her outfit and more here! The star made sure to give back this year, and she looked gorgeous while doing it. La La rocked a long-sleeved white crop-top sweater and a matching pencil skirt. The outfit looked great with her trendy lace-up boots. The woman took the time to help those less fortunate during her Winter Wonderland-themed bash. La La posed in her great outfit that definitely complimented her figure and chose to only wear a few accessories. What the charitable event did was bring together no less than 250 children from the Young Women’s Leadership School of the Bronx as well as their partner school I.S. 117 Joseph H. Wade and gift them this amazing holiday extravaganza. La La was not alone at the event but was also joined by her family and close friends. 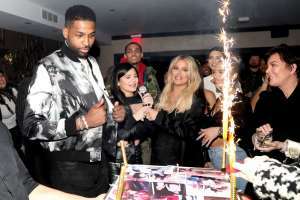 That being said, her son was in attendance but also some fellow celebrities such as Dave East and Fabolous were there and even performed live. ‘A lot of these kids you know do not have much they’re down on themselves there is a lot of bullying going on in the world, so I want to lift their spirits up. It is a chance to give back, to see the children having fun for the holidays, dancing and having a good time. We are giving away toys, food, we just want to have a loving environment for the kids,’ La La opened up about the charitable bash in a previous interview. What do you think about the event La La organized? What about the outfit she wore?